Find your tropical island paradise at the lagoon-facing Holiday Inn Resort Kandooma Maldives. Speedboats ferry you across the turquoise waters from Ibrahim Nasir International Airport to the contemporary resort hotel in just 40 minutes. 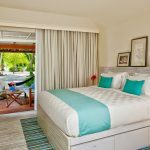 Ladled with cool, contemporary Island design, Holiday Inn Resort® Kandooma Maldives brings a modern vibe to the Maldives. Slip into island life from the moment you arrive at Holiday Inn Resort® Kandooma Maldives, with world-class South Male Atoll diving and surfing on your doorstep. Learn to sail on a catamaran trip around the region’s sandbanks or take it easy with alcohol-free cocktails on a sunset cruise. Top off a perfect day with breathtaking sunsets on the deck at The Kitchen restaurant. Enjoy unobstructed panoramas of sun, sea and sky from the spectacular Overwater Pavillion. With additional space for indoor and outdoor living, this two bedroom Pavillion is perfect for families with a generous 170 sqm of space. Like all the villas at the Holiday Inn Kandooma Maldives resort, the design villa offers you all the luxury you could need for a complete and wonderful stay on the island. The expansive private sundeck is the ideal place to relax and take in the tranquil, pristine lagoon and is furnished with a day bed and a table for outdoor dining along with direct access to the sea. You can completely relax in your hammock while enjoying the view of the clear waters beneath and around you. 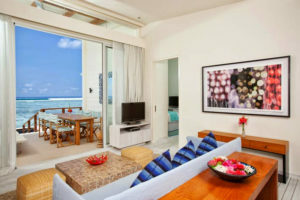 The main bedroom connects to a full bathroom that features a double vanity and, also showcases a private outdoor rain shower and bath tub with splendid views of the Indian Ocean. Enjoy a sunny afternoon reading or relaxing in your private overwater sitting area with day bed and take in the sounds of the ocean. The Overwater Villa offers the ultimate in the Maldives experience. 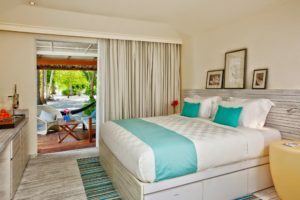 Hovering above coral and marine life in the shallow clear waters, guests will enjoy their time on the private sun deck, dangling their feet in the water, or at high tide, relaxing in a partially submerged hammock. Enjoying the comfort of you overwater villa, you will be able to take in the sights that the Maldives are known for: the stunning blue ocean and the white beaches of the Kandooma island. Expansive living space is complemented by a large open bathroom which offers an outdoor shower and bathtub and views of the water. 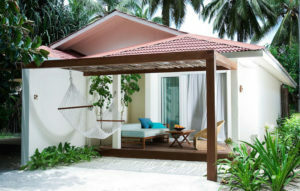 As with all the villas at Holiday Inn Maldives, you will be able to enjoy the comfort of a beautifully designed villa. 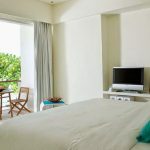 This ensures you will be able to completely relax and enjoy your stay on the island of Kandooma Maldives. The Overwater Villas are 85 square metres in size. The Family Beach Houses, as the name suggests, are ideal for families or a small group of divers, and are the size of two Beach House’s together. They offer sleeping space upstairs as well as living and dining below. Because of the first floor bedrooms you will be able to enjoy beautiful sights of the ocean around the Kandooma island, straight from your bedroom. The Family Beach House is beautifully designed and will offer you complete relaxation during your stay. 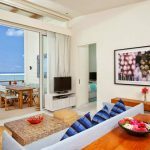 Just step outside the door and feel the warm white sand between your toes and at the end of the day retreat for the evening to enjoy the comfort of your living room. Because of the open design of the family beach house, you will be able to fully enjoy the view of the beautiful Kandooma island and the Maldivian sea at all times. The sea-facing Sea View Beach House is a 2 floor villa that offers the luxury of space and comfort. Located at the water’s edge, the villas present a striking mix of natural elements and modern design. The ground floor offers an open view of the area surrounding the villa, allowing you to truly experience the beauties of the island. 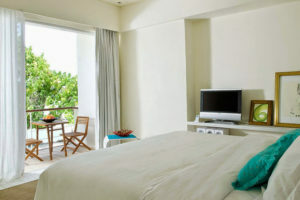 The bedrooms are located on the first floor level of the villa and so enjoy views of the sea. The living area underneath the bedroom is furnished with designer furniture laid out on a carpet of the white sand. The living area is designed to bring you all the comforts you need to completely relax and recharge during your stay at the Holiday Inn Resort Kandooma Maldives resort. Each Sea View Beach House is 72 square meters in size, with 36 square meters on each level. 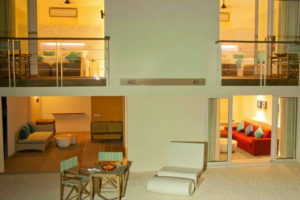 The Beach view villas have an open view to the beach. 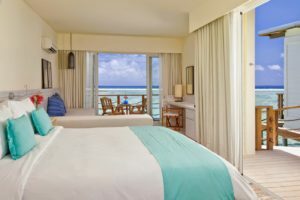 Allowing you to take in the sights of on the sandy white beaches and the clear blue waters beyond. Like all Kandooma’s accommodation, the semi-detached garden & beach view villas come with large picture windows that positively invite the outdoors inside. Whitewashed floor boards evoke a sense of fresh coolness, yet feel warm and textured to bare feet. Luxury comes from the light summer duvets and generously proportioned bath towels. The Beach Villa is a beautifully designed villa, offering luxuries like a Flat screen television, a place to plug in your mp3/ipod, both indoor and outdoor showers and wifi broadband as standard, in addition to all the other usual amenities you would expect of a world class lifestyle resort. Nothing will get in the way of a completely relaxing, wonderful stay at the Holiday Inn Resort Kandooma Maldives. 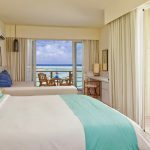 Like all of accommodations at the Holiday Inn Resort Kandooma Maldives, the semi-detached garden & beach view villas come with large picture windows that positively invite the outdoors inside. Whitewashed floor boards evoke a sense of fresh coolness, yet feel warm and textured to bare feet. Luxury comes from the light summer duvets and generously proportioned bath towels. The Garden Villa offers luxury like a flat screen television, a place to plug in your mp3/iPod, both indoor and outdoor showers and wifi broadband as standard, in addition to all the other usual amenities you would expect of a world class lifestyle resort. 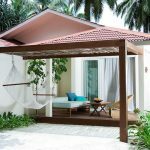 A stay in the Kandooma Garden Villa offers you all the comforts you could need to completely relax on your vacation on the beautiful Maldives island. 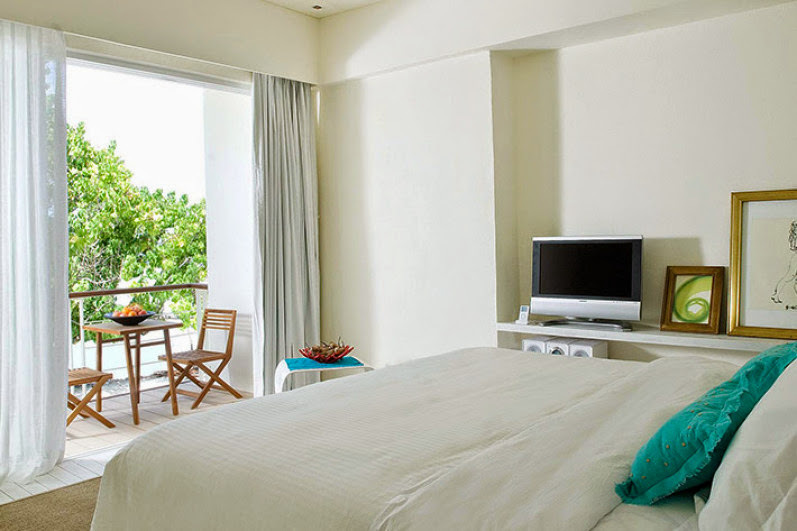 While both garden and beach villas are facing the sea, the Garden view villas are located further inwards the island.